Formerly part of the HomeBuilders Couples Series®. Includes the same practical help and teaching. Get your group ready to connect with this great starter pack! Your marriage is growing every day as you build on the promises that you've made to each other and learn to deal with setbacks and challenges. Some days it's less than you hoped for and other days it's more than you ever dreamed. No matter how good, difficult, long, or short your time has been, you can use God’s design for marriage to grow closer to your spouse. As you join your spouse and a small group of friends for this seven-week study, you'll learn to accept your spouse as a uniquely designed gift from God, how to recognize when you're drifting apart and how to work together to close the distance. This study will help you build a future that is secure, purposeful, and fun. Together you will learn how to build a marriage that will last. 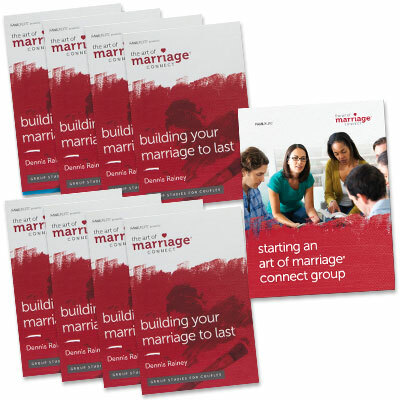 The Starter Pack includes 8 copies of the study guide and one copy of Starting an Art of Marriage Connect Group. The Art of Marriage® Connect Series (formerly published as the HomeBuilders Couples Series® has been developed to help build marriages according to God's design. With global distribution of more than 2 million copies in 77 countries, each study focuses on real-life topics, practical application and biblical truth. Whether newlyweds, empty nesters or somewhere in between, connect with other couples--and find help and hope for your marriage. This kit contains 8 copies of the study guide and one copy of Starting an Art of Marriage Connect Group.